It’s always important to salute the patrons in the automotive community who devote their entire lives to perfecting their skill. I stumbled upon Mr. Richard Lin while searching for a high horsepowered Mini Cooper. It turns out Richard is currently voted Orange County California’s best car detailer and his business is starting to take off. We exchanged a few emails and unfortunately, he had informed me that the Mini has been sold. However, he did acquire a new Clubman Mini S, with a few streetable mods (nothing crazy like his last ride) so i decided to pay him a visit. Gloomy skies and showers are rare in Southern California, but with my luck, its nothing out of the ordinary. The photo shoot had to be relocated inside his detail bay, where I noticed his newly acquired airbag lift. Richard was very friendly and showed me around, and by his personality I can tell that he’s a very intelligent detailer who was even knowledgeable about chemical properties and their effects on paint surfaces. This story isn’t some shameless plug to promote his business, it’s an explanation of something great that I had discovered, that directly relates to the American dream. You can really make a living doing the things you like! Richard traveled a long, hard road before opening his business… before detailing, his primary business was developing skin care products! That transcended to developing car care chemicals… the rest is history. Every few weeks, he holds a free car care clinic for the community, where he teaches various techniques on how to make your car shine like new. One thing Richard’s very proud of on his new Mini Clubman is the paddle shifting mechanism on his John Cooper Works Alcantara steering wheel. He’s the first in North America to pull this off. The benefit of this fabric is that Alcantara suede feels good against the palm of the hand regardless of the outside heat or cold. The wheels were custom powdercoated along with the calipers, with sportier H&R suspension, Hotchkis sway bars, Texas Speed Works rear control arms setup for the daily driving and weekend fun. As you can see, the camera flash captures the liquid chemical Richard uses on the fender trim. This plastic is usually chapped and dry on regular Clubmans out on the street, but never on Richard’s! John Cooper Works is a manufacturer associated vehicle tuner, producing many performance and aesthetic goodies for the Mini. 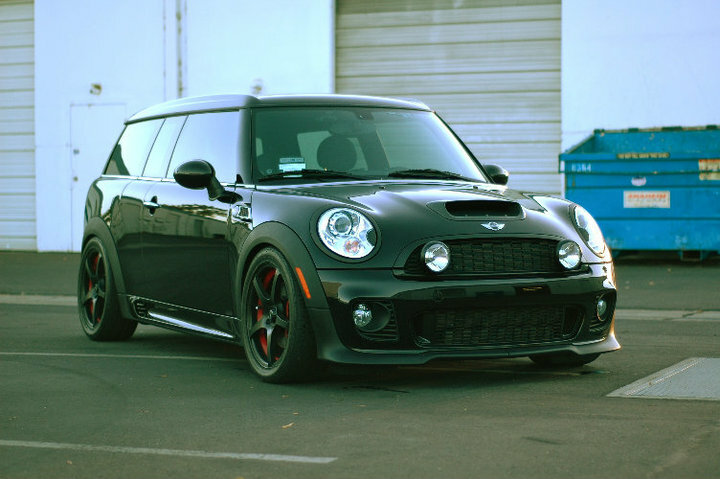 Looking closely, Richard’s Clubman sports many of these parts which set it apart from any other Mini Cooper on the dealer lot. The Clubman version has a rear suicide door which its unique design makes it easier for rear passengers to go in and out. I noticed that his obsession for cars extends past Minis where I noticed his pristine Toyota MR2 sitting in the back of the shop. Richard is otherwise known as the Octaneguy in the Mini Cooper community, where he shares his detailing know-how with the crowd. I highly suggest you consult with him for any kind of blemishes or damages to body paint surfaces. He’s always willing to share his knowledge and expertise without asking for anything in return. This is how the beautiful black paint looks under natural sunlight and the JCW full aero kit blends in well with the curves of BMW’s design. The stance is perfect, without any rubbing during hard cornering. He claims that the philosophy of sacrificing reliability for performance just didn’t fit his lifestyle anymore. Let’s hope that Richard doesn’t catch the horsepower bug again and start going crazy on the engine modifications like on his last ride. But that’s not really a bad thing… is it? Now that’s what a TRUE mini should look like! Top notch!! Man!! That is one nice Mini! !